Enoch Magazine traveled to Atlanta Georgia in early December to document a street minister named Sean Rogers. Sean does a lot of work with the local men’s homeless shelter, and it was outside that shelter that I ran into Karl. Certainly, the first thing you notice about Karl is his swollen eye. He told me he had been robbed and beaten with a metal pipe the previous night, but he also admitted that he shouldn’t have been where he was when he was…and he left it at that. This video featuring Karl is the first Enoch video that is literally not edited. It’s important to note that this conversation occurred while Karl had a concussion, and was on a 24 hour watch, (in case fluid started to run out of his nose). But with no health coverage, the hospital prescribed him some basic pain medication and released him and his clenched pillow back to the streets. His eye looked way worse in person, so you can imagine my joy when Karl asked if I could take him to the CVS store and pay for his medicine. Karl didn’t have the $11 to pay for the cheapest pain reliever that was prescribed to him. When I agreed, he told me he had already submitted the prescription order, asked what it would cost and then prayed that God would provide the means to pay for it. Once I paid for Karl’s prescription at the CVS store, he asked for some additional items, like neosporin, deodorant, a razor and coco butter. Homeless ministry can get confusing for some people when money becomes involved. Most people start to worry about being taken advantage of. 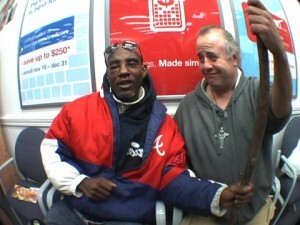 Others have a strick “no money” policy when they’re on the streets, (like Sean Rogers sitting next to Karl in the photo), so the money issue never even becomes an issue. 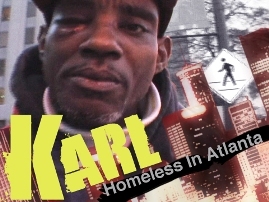 I believe Karl was sent to that location in Atlanta so I could meet him and thousands of viewers could hear what he had to say. You’ll notice at the beginning, he says “…God is speaking to you, through me.” Normal people just don’t talk like that! I guess Street Faith and the World Wide Underground is more alive than we originally thought. It’s a reminder to me that some of the least expected people stand up for Christ first. Rockstars and famous people around the world have millions of people listening to them, but they never say the kind of stuff Karl did. I just think it’s crazy that the person who immediately shares his testimony and tells others about Jesus is a beaten, abused, homeless man with no possessions. As I logged our footage from that weekend in Atlanta, I noticed I have more footage of Karl, so you’ll probably see more of what he had to say that day. But I’ll say, the whole “Karl” experience was pretty encouraging. If you want to support Enoch Magazine as we return to Skid Row this January, please send us a paypal donation! $5 would pay for 3 sandwiches which we’ll make out there and distribute. Wow how incredible. I can’t imagine how encouraging and astonishing it must have been to witness that. God works in amazing ways!